Names of Jerusalem refers to the multiple names by which the city of Jerusalem has been known and the etymology of the word in different languages. According to the Jewish Midrash, "Jerusalem has 70 names". Lists have been compiled of 72 different Hebrew names for Jerusalem in Jewish scripture. 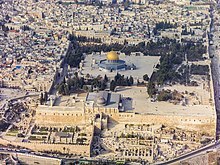 Today, Jerusalem is called Yerushalayim (Hebrew: יְרוּשָׁלַיִם‎) and Al-Quds (Arabic: اَلْـقُـدْس‎). Yerushalayim is a derivation of a much older name, recorded as early as in the Middle Bronze Age, which has however been repeatedly re-interpreted in folk etymology, notably in Biblical Greek, where the first element of the name came to be associated with Greek: ἱερός (hieros, "holy"). The city is also known especially among religious-minded Muslims as Bayt al-Maqdis (Arabic: بَـيْـت الْـمَـقْـدِس‎), which means House of Holiness. A city called Rušalim in the Execration texts of the Middle Kingdom of Egypt (c. 19th century BCE) is sometimes identified as Jerusalem although this has been challenged. Jerusalem is called either Urusalim (URU ú-ru-sa-lim) or Urušalim (URU ú-ru-ša10-lim) in the Amarna letters of Abdi-Heba (1330s BCE). Also in the Amarna letters, it is called Beth-Shalem, the house of Shalem. Jerusalem is the name most commonly used in the Bible, and the name used by most of the Western World. The Biblical Hebrew form is Yerushalaim (ירושלם), adopted in Biblical Greek as Hierousalēm, Ierousalēm (Ιερουσαλήμ), or Hierosolyma, Ierosolyma (Ιεροσόλυμα), and in early Christian Bibles as Syriac Ūrišlem (ܐܘܪܫܠܡ) as well as Latin Hierosolyma or Ierusalem. In Arabic this name occurs in the form Ūrsālim (أْوْرْسَـالِـم). The name "Shalem", whether as a town or a deity, is derived from the same root as the word "shalom", meaning peace, so that the common interpretation of the name is now "The City of Peace" or "Abode of Peace". The ending -ayim indicates the dual in Hebrew, thus leading to the suggestion that the name refers to the two hills on which the city sits. However, the pronunciation of the last syllable as -ayim appears to be a late development, which had not yet appeared at the time of the Septuagint. In fact, in the unvocalized Masoretic Text of the Hebrew Bible the yod that would be required for the -ayim ending (so that it would be written ירושלים, as in post-biblical Hebrew, rather than ירושלם) is almost always absent. It is only the much later vocalization, with the vowel marks for a and i squeezed together between the lamed and the mem, that provides the basis for this reading. In Genesis Rabbah 56:10, the name is interpreted as a combination of yir'eh, "He will see [to it]," and Shalem, the city of King Melchizedek (based on Genesis 14:18). A similar theory is offered by Philo in his discussion of the term "God's city." Other midrashim say that Jerusalem means "City of Peace". In Greek, the city is called either Ierousalēm (Ἰερουσαλήμ) or Hierosolyma (Ἱεροσόλυμα). The latter exhibits yet another re-etymologization, by association with the word hieros (Greek: ἱερός, "holy"). Similarly the Old Norse form Jorsala exhibits a re-interpretation of the second element as -sala, denoting a hall or temple, common in Old Norse toponyms. The name Shalem/Salem (שלם šālêm) is found in the account of Melchizedek in Genesis 14:18: And Melchizedek king of Salem brought forth bread and wine: and he was the priest of the most high God (El Elyon). That the name Salem refers to Jerusalem is evidenced by Psalm 76:2 which uses "Salem" as a parallel for "Zion", the citadel of Jerusalem. The same identification is made by Josephus and the Aramaic translations of the Bible. Shalem was the Canaanite god of dusk, sunset, and the end of the day, also spelled Shalim. Many scholars believe that his name is preserved in the name of the city Jerusalem. It is believed by some scholars that the name of Jerusalem comes from Uru + Shalem, meaning the foundation of Shalem or founded by Shalem or city of Shalem, and that Shalem was the city god of the place before El Elyon. Mount Zion (Hebrew: הר צִיּוֹן Har Tsiyyon) was originally the name of the hill where the Jebusite fortress stood, but the name was later applied to the Temple Mount just to the north of the fortress (also known as Mount Moriah, possibly also referred to as "Daughter of Zion" (i.e., as a protrusion of Mount Zion proper) originally). Still later (Second Temple era), the name came to be applied to a hill just to the south-west of the walled city. This latter hill is still known as Mount Zion today. From the point of view of the Babylonian exile (6th century BCE), Zion has come to be used as a synonym of the city of Jerusalem as a whole. Adonai-jireh "The Lord sees", in Vulgate Latin Dominus videt. In the opinion of some Rabbinic commentators, the combination of Yir'eh (יראה) with Shalem (שלם) is the origin of the name Jerusalem (ירושלם). Neveh Tzedek (נווה צדק) "Oasis of Justice", Tiberian Hebrew נְוֵה-צֶדֶק Nəwēh Ṣeḏeq, in the Book of Jeremiah 31:22. Hebrew: kiryat melekh rav (קרית מלך רב) as in Psalm 48:2. Koine Greek: polis megalou basileos (πόλις μεγάλου βασιλέως) as in Matthew 5:35. According to "Shahnameh", ancient Iranian used "Kang Diz Huxt" کَـنْـگ دِژ هُـوْخْـت or "Diz Kang Huxt" دِژ کَـنْـگ هُـوْخْـت to name Jerusalem . "Kang Diz Huxt" means "holy palace" and was the capital of "Zahhak" and also "Fereydun's" kingdom. Another variant of the name is Kang-e Dožhuxt (Dožhuxt-Kang), which is attested in Shahnameh. It means "[the] accursed Kang". Aelia Capitolina was the Roman name given to Jerusalem in the 2nd century, after the destruction of the Second Temple. The name refers to Hadrian's family, the gens Aelia, and to the hill temple of Jupiter built on the remains of the Temple. During the later Roman Era, the city was expanded to the area now known as the Old City of Jerusalem. Population increased during this period, peaking at several hundred thousand, numbers only reached again in the modern city, in the 1960s. From this name derive Arabic إِيْـلْـيَـاء‎ ʼĪlyāʼ, Tiberian Hebrew אֵילִיָּה קַפִּיטוֹלִינָה ʼÊliyyāh Qappîṭôlînāh, Standard Hebrew אֵילִיָּה קַפִּיטוֹלִינָה Eliyya Qappitolina. The Roman name was loaned into Arabic as ʼĪlyāʼ, early in the Middle Ages, and appears in some Hadith (Bukhari 1:6, 4:191; Muwatta 20:26), like Bayt ul-Maqdis. Jerusalem fell to the Muslim conquest of Palestine in 638. The medieval city corresponded to what is now known as the Old City (expanded in the 2nd century as Roman Aelia Capitolina). Population at the time of the Muslim conquest was about 200,000, but from about the 10th century it declined, to less than half that number by the time of the Christian conquest in the 11th century, and with the re-conquest by the Khwarezmi Turks was further decimated to about 2,000 people (moderately recovering to some 8,000 under Ottoman rule by the 19th century). The modern Arabic name of Jerusalem is اَلْـقُـدْس al-Quds, and its first recorded use can be traced to the 9th century CE, two hundred years after the Muslim conquest of the city. Prior to the use of this name, the names used for Jerusalem were إِيْـلْـيَـاء Iliya (from the Latin name Aelia) and بَـيْـت الْـمَـقْـدِس (Bayt al-Maqdis) or بَـيْـت الْـمُـقَـدَّس (Bayt al-Muqaddas). Tiberian Hebrew הַקֹּדֶשׁ HaQodhesh "The Holy"
Bayt al-Maqdis or Bayt al-Muqaddas is a less commonly used Arabic name for Jerusalem though it appeared more commonly in early Islamic sources. It is the base from which nisbas (names based on the origin of the person named) are formed - hence the famous medieval geographer called both al-Maqdisi and al-Muqaddasi (born 946.) This name is of a semantic extension from the Hadiths used in reference to the Temple in Jerusalem, called Beit HaMikdash (בית המקדש "The Holy Temple" or "Temple of the Sanctified Place") in Hebrew. Arabic: اَلْـبَـلَاط‎ al-Balāṭ is a rare poetic name for Jerusalem in Arabic, loaned from the Latin palatium "palace". Also from Latin is إِيْـلْـيَـاء ʼĪlyāʼ, a rare name for Jerusalem used in early times Middle Ages, as in some Hadith (Bukhari 1:6, 4:191; Muwatta 20:26). ^ Ilana Caznelvugen lists the 72 names in her two articles "Many names for Jerusalem" and "70 Names for Jerusalem", Sinai 116, Mosad Harav Kook, 1995. The Jerusalem municipality website lists 105 Hebrew names. ^ David Noel Freedman; Allen C. Myers; Astrid B. Beck (2000). Eerdmans dictionary of the Bible. Wm. B. Eerdmans Publishing. pp. 694–695. ISBN 978-0-8028-2400-4. Retrieved 19 August 2010. . Nadav Naʼaman, Canaan in the 2nd Millennium B.C.E., Eisenbrauns, 2005 p. 177ff., offers a dissenting opinion, arguing for the transcription Rôsh-ramen, etymologised to r'š (head) and rmm (be exalted), to mean 'the exalted Head', and not referring to Jerusalem. ^ G. Johannes Botterweck, Helmer Ringgren (eds.) Theological Dictionary of the Old Testament (tr. David E. Green), William B. Eerdmann, Grand Rapids Michigan, Cambridge/UK 1990, vol. VI, p. 348. ^ a b Binz, Stephen J. (2005). Jerusalem, the Holy City. Connecticut, USA. : Twenty-Third Publications. p. 2. ISBN 9781585953653. Retrieved 17 December 2011. ^ Elon, Amos. Jerusalem. HarperCollins Publishers Ltd. ISBN 0-00-637531-6. Retrieved 26 April 2007. The epithet may have originated in the ancient name of Jerusalem—Salem (after the pagan deity of the city), which is etymologically connected in the Semitic languages with the words for peace (shalom in Hebrew, salam in Arabic). ^ Hastings, James (2004). A Dictionary of the Bible: Volume II: (Part II: I -- Kinsman), Volume 2. Honolulu, Hawaii: Reprinted from 1898 edition by University Press of the Pacific. p. 584. ISBN 1-4102-1725-6. Retrieved 17 December 2011. ^ Bosworth, Clifford Edmund (2007). Historic cities of the Islamic world. The Netherlands: Koninklijke Brill NV. pp. 225–226. ISBN 90-04-15388-8. Retrieved 17 December 2011. ^ Denise DeGarmo (9 September 2011). "Abode of Peace?". Wandering Thoughts. Center for Conflict Studies. Retrieved 17 December 2011. ^ E.g. found in the Septuagint and the writings of Philo; cf. Melchizedek as "king of peace" (Σαλήμ) in Heb. 7.1–2, based on Gn. 14.18; cf. also Philo, leg. all. 3.79. ^ Cf. e.g. Flavius Josephus, Ant. J. 1.180. ^ E.g., L. Grabbe, "Ethnic groups in Jerusalem", in Jerusalem in Ancient History and Tradition (Clark International, 2003) pp. 145-163; John Day, Yahweh and the gods and goddesses of Canaan, Sheffield Academic Press 2002, p. 180; see also Shalim. ^ Yisrael Shalem, "Jerusalem: Life Throughout the Ages in a Holy City", Ingeborg Rennert Center for Jerusalem Studies, Bar-Ilan University (2012). See also Karel van der Toorn, et al., Dictionary of Deities and Demons in the Bible, under entry ZEDEQ, p. 931. ^ See Encyclopedia Judaica: Ariel. For etymologies, see Abarim. ^ Lurje, Pavel. "KANGDEZ". Encyclopaedia Iranica. Retrieved 15 April 2017. ^ El-Awaisi, Khalid. "From Aelia To Al-Quds: The Names Of Islamicjerusalem In The Early Muslim Period", 2011. Retrieved on 22 May 2014. ^ Carrol, James. "Jerusalem, Jerusalem: How The Ancient City Ignited Our Modern World", 2011. Retrieved on 24 May 2014.